Connect to a SharePoint site to generate an app automatically from a custom list, or create a connection before you add data to an existing app or build an app from scratch. Show data from a custom list in a SharePoint Online site or an on-premises site. Show images and play video or audio files in a library (SharePoint Online only). If you want to manage data in a custom list, PowerApps can generate a three-screen app for you automatically. Users can browse the list on the first screen, show details of an item in the second screen, and create or update items in the third screen. If your SharePoint list contains a Choice, Lookup, or Person or group column, see Show data in a gallery later in this topic. 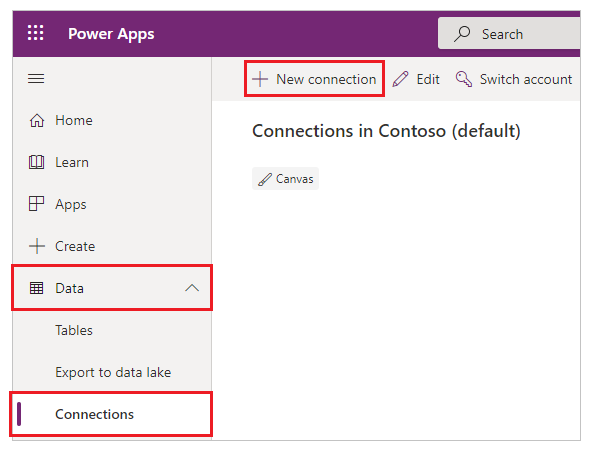 Sign in to PowerApps, select Data > Connections in the left navigation bar, and then select New connection near the upper-left corner. In the search box near the upper-right corner, type or paste SharePoint, and then select SharePoint. 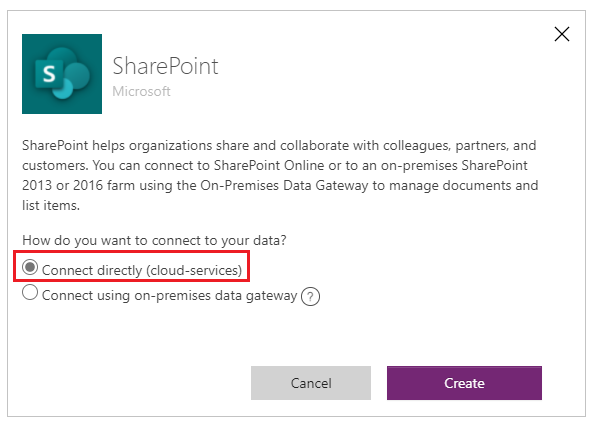 To connect to SharePoint Online, select Connect directly (cloud services), select Create, and then provide credentials (if prompted). The connection is created, and you can add a data to an existing app or build an app from scratch. 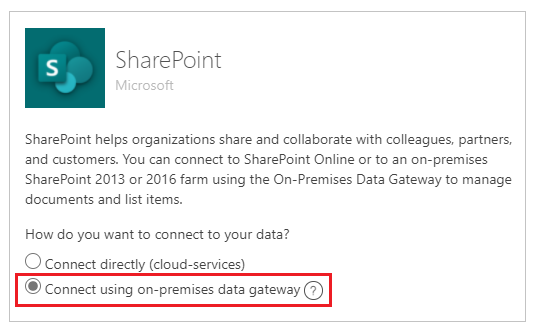 To connect to an on-premises site, select Connect using on-premises data gateway. Under Choose a gateway, select the gateway that you want to use, and then select Create. If you don't have an on-premises data gateway installed, install one, and then select the icon to refresh the list of gateways. 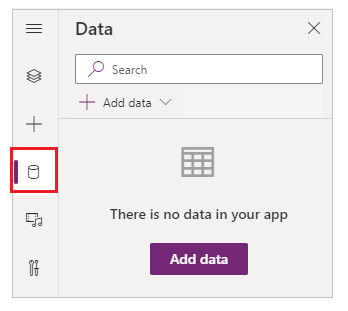 In PowerApps Studio, open the app that you want to update, select the View tab, and then select Data sources. In the Data pane, select Add data source > SharePoint. 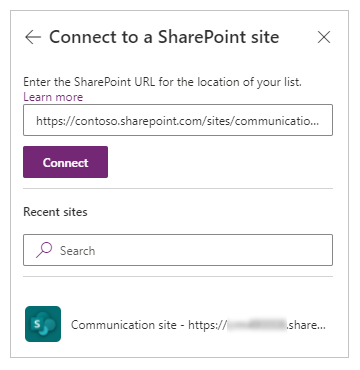 Under Connect to a SharePoint site, select an entry in the Recent sites list (or type or paste the URL for the site that you want to use), and then select Connect. Not all types of lists appear by default. 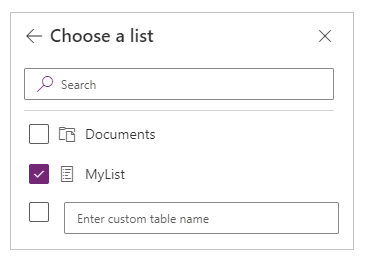 PowerApps supports custom lists, not template-based lists. If the name of the list that you want to use doesn't appear, scroll to the bottom, and then type the name of the list in the box that contains Enter custom table name. The data source or sources are added to your app. Apply the concepts in Create an app from scratch to SharePoint instead of Excel. For a Choice or Lookup column, specify ThisItem.ColumnName.Value to show data in that column. 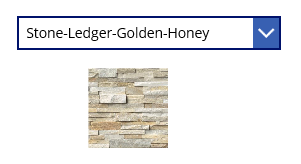 For example, specify ThisItem.Location.Value if you have a Choice column named Location, and specify ThisItem.PostalCode.Value if you have a Lookup column named PostalCode. For a Person or Group column, specify ThisItem.ColumnName.DisplayName to show the display name of the user or the group. For example, specify ThisItem.Manager.DisplayName to show display names from a Person or Group column named Manager. You can also show different information about users, such as email addresses or job titles. To display a complete list of options, specify ThisItem.ColumnName. (including the trailing period). For a CreatedBy column, specify ThisItem.Author.DisplayName to show the display names of users who created items in the list. For a ModifiedBy column, specify ThisItem.Editor.DisplayName to show the display names of users who changed items in the list. For a Managed Metadata column, specify ThisItem.ColumnName.Label to show data in that column. For example, specify ThisItem.Languages.Label if you have a Managed Metadata column named Languages. If you have several images in a SharePoint library, you can add a Drop down control to your app so that users can specify which image to show. You can also apply the same principles to other controls, such as Gallery controls, and other types of data, such as videos. If you haven't already, create a connection, and then add data to an existing app. Add a Drop down control, and name it ImageList. Set the Items property of ImageList to Documents. On the Properties tab of the right-hand pane, open the Value list, and then select Name. The file names of the images in your library appear in ImageList. Press F5, and then select a different value in ImageList. The image that you specified appears. You can download a sample app that demonstrates a more complex approach to showing data from a SharePoint library. After you download the app, open PowerApps Studio, select Open in the left navigation bar, and then select Browse. In the Open dialog box, find and open the file that you downloaded, and then add a SharePoint library as a data source by following the first two procedures in this topic. By default, this app shows delegation warnings, but you can ignore them if your library contains fewer than 500 items. In this one-screen app, the list in the lower-left corner shows all files in your library. You can search for a file by typing or pasting one or more characters in the search box near the top. If your library contains folders, you can filter the list of files by selecting a filter icon in the list of folders just under the title bar. When you find the file that you want, select it to show it in the Video, Image, or Audio control along the right-hand side. PowerApps can read column names that contain spaces, but the spaces are replaced with the hexadecimal escape code "_x0020_". 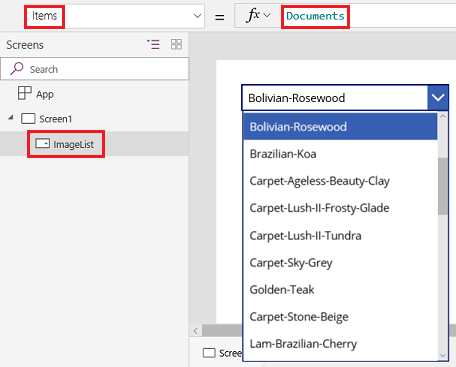 For example, "Column Name" in SharePoint will appear as "Column_x0020_Name" in PowerApps when displayed in the data layout or used in a formula. Not all types of columns are supported, and not all types of columns support all types of cards. You can't upload files from PowerApps to a library. You can't show PDF files from a library in a PDF Viewer control. PowerApps Mobile doesn't support the Download function. 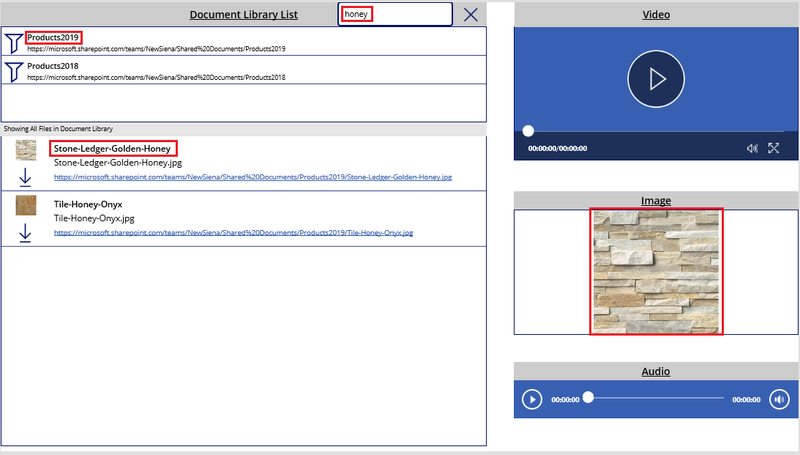 If your users will run the app in PowerApps Mobile or the Windows 10 app, use the Launch function to display library content in a gallery.